A deliciously spiced, super easy treat that is perfect for gatherings or to simply get those little hands in the kitchen! Today I’m sharing a super simple recipe with you guys for the tastiest little snack – Pumpkin Spice Muddy Buddies! Is it too early for pumpkin? I’m trying to introduce it slowly so I don’t shock you guys since I have a full-blown pumpkin recipe coming next week, hehe. 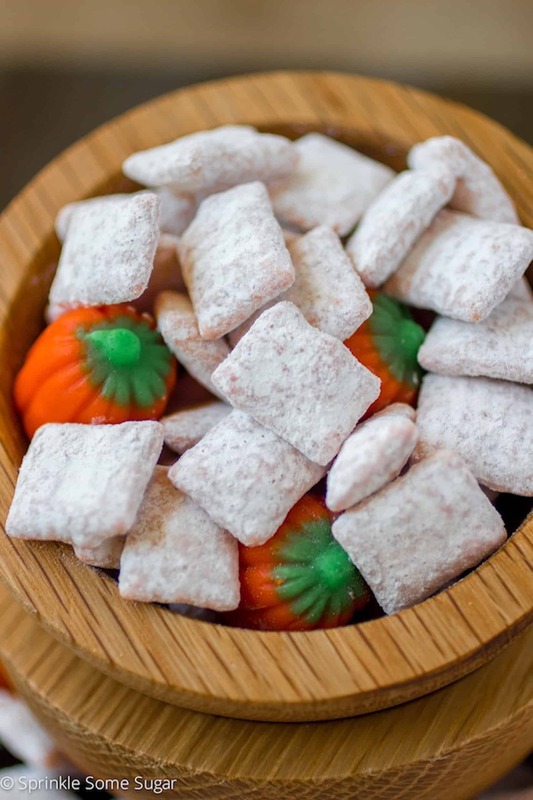 Muddy buddies are also referred to as puppy chow – not to be confused with actual puppy chow. These are not for dogs.. I feel like I have to clarify that because I had a reader yell at me once for feeding these to my dog. Clearly she didn’t read the post. Anyways, moving on.. fair warning: these are addicting! These muddy buddies start with one of my favorite cereals, Rice Chex (how boring am I? ), and are covered in a mixture of orange candy melts (you could just use the same amount of regular white chocolate if you’d like) with a little bit of pumpkin pie spice mixed in and then they are coated in a sugary, pumpkin pie spice mixture. I mixed in some cute little marshmallow creme pumpkins to make a perfect Fall/Halloween-themed snack. Perfect for any parties you have coming up! This is pretty much the easiest snack to create in the history of snacks. Such a great way to get your kids in the kitchen and let me tell you, they are going to love this! All you need is 10 minutes from start to finish and you can create this tasty treat. I hope you enjoy! In a large bowl, measure out cereal and set aside. In a large ziploc bag, add confectioner's sugar and 2 tsp of pumpkin pie spice. Shake it around a little to incorporate. In another bowl, melt candy melts (or white chocolate) in the microwave at 30 second intervals until melted and stir in 1 tsp of pumpkin pie spice. Pour mixture over cereal and gently mix very well until all cereal is completely coated with the chocolate. Dump cereal mixture into the bag of spiced sugar, seal it up and shake vigorously until all of the cereal is thoroughly coated with the sugar mixture. You can go ahead and dump it in a bowl and enjoy right away, but I like to pour mine into a strainer and give it a little shake to remove the excess sugar. Add marshmallow creme pumpkins and serve. 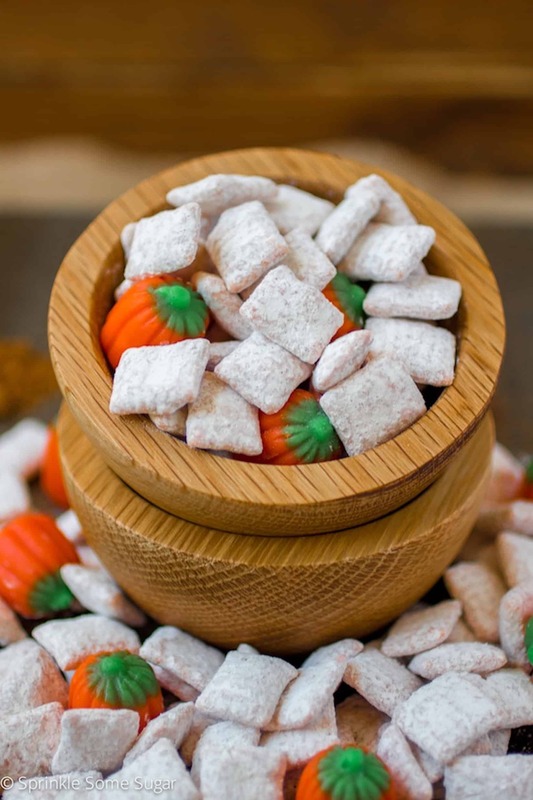 Pumpkin Spice Muddy Buddies will stay fresh for up to one week stored in an airtight container at room temperature.